That same evening before it got dark, they would sing to the seal because he’d been sacrificed. And they would cut it up and hang it in the smoke house. This large feast bowl for serving seal oil is sculpted in the animal’s own form with the joints and appendages outlined along the sides. Haida men hunted harbor and fur seals in the Queen Charlotte Islands and along the Alaska coast, seeking their meat, rich fat, and valuable pelts. Hunters fasted and purified themselves before sealing and made offerings to the Ocean People, or killer whales, who are the masters of all other sea creatures. Seal oil was a prized condiment for dipping dried fish and is still served at Haida gatherings. Aron Crowell: Emmons recorded it as a seal. Rosita Worl: Sea lion though, right? Donald Gregory: That’s what it looks like because of the eyeball. On the carvings with the sea lion they have a big eyeball. Delores Churchill: And that why I asked to see the flippers, sometimes the flippers will tell you. Donald Gregory: It’s Haida though, that’s why I can’t figure it out. Delores Churchill: Donald, what kind of material do you think it is? Gee, those undercuts are incredible, aren’t they? Clarence Jackson: Wow, look at that. Alder I bet. Kind of trying to get white. Delores Churchill: It’s so shiny. Donald Gregory: I think they probably used oils, it had oils or something in it. Peter Jack: I think it might be alder, because there’s some white spots on it. Delores Churchill: How old was it? Clarence Jackson: [Collected] 1912 or 6. So, it’s probably older than that too. It’s really well preserved. It’s been used too. . .
Donald Gregory: Well this is the tail and then the flippers [pointed end]. So there’s a space between the tail and the flippers.
. . . And then the ovoid here, that’s the joint. Clarence Jackson: Again that’s probably a ceremonial dish. Delores Churchill: Donald, do you think that was one that was heated and spacers put in there? Do you think it was carved like that? Donald Gregory: No, I think they carved it, and they roughed it out so far, and they let it warp and do what it was going to go. And then, when they were done doing the carving, they probably came in and cleaned it all up so that it was uniformly the same thickness. They have to, when they carve it, they have to kind of carve it pretty quick, otherwise it will crack and it will distort. Delores Churchill: Is that why my grandsons keep all their bark in the freezer? Donald Gregory: The alder wood when they’re carving it? Clarence Jackson: Not a Tlingit trick. Donald Gregory: But we heard about it up here. And the way the ovoids are cut, they’re cut a little different. The Tlingit carving is real shallow around relief. This one is cut in deep. If you can see right here, it cuts in deep [along side]. When you see the old Tlingit style, it’s real shallow carving on the ovoids, and then on the Haida it seems to be a lot deeper. Delores Churchill: Again I think, like you said Clarence, I’m sure it’s a feast dish that’s only brought out during a certain feast, memorials or somebody getting a new name, or a new chief. Delores Churchill: Right, a wedding, it would be taken out at that time. Because in Klukwan, even I saw an apron that they took undone and started weaving on. And it was brought out just recently when I was up there when the Yukon people came down about the Old Man, the Long Ago Man. We had a diner, and so they brought it out in honor of the Long Ago Man so we could all look at it. 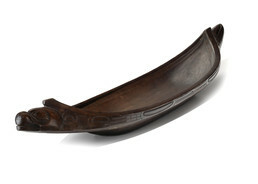 So I kind of think that’s the same kind of dish. . . . It’s really a beautifully carved piece though. Clarence Jackson: Boy it is very pretty. Donald Gregory: And it’s really uniform.